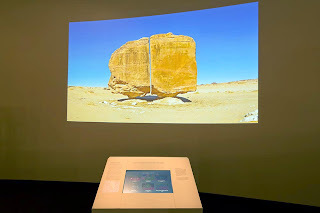 In 2012, the CREATE Lab and UPCLOSE collaborated with the British Museum to develop a multimedia interactive kiosk based on gigapixel images of petroglyph sites in the Saudi Arabian desert collected by Dr. Sandra Olsen of the Carnegie Museum of Natural History's as part of her documentation and research on the evolution of horse-human relations. Depicted in the ancient rock art is evidence of increasing equid domestication including bridle and tack usage, signs of cross-breeding, depictions of mounted calvary and two-wheeled chariots. To help visitors see this remarkable evidence pecked and carved into rock faces found in remote corners of the Arabian peninsula, the British Museum installed the shown kiosk below. This work and findings would inform the the Stories in the Rock demonstration project we developed. 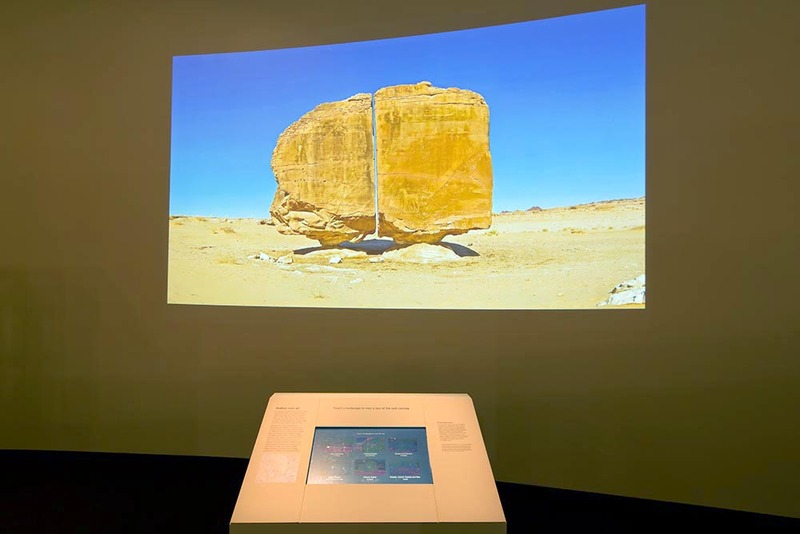 Figures 1-3: The interactive kiosk offer a selection of six petroglyph sites in Saudi Arabia. The selected image was displayed in large projection and a series of zoom revealed closeup view and captions of points of interest within the image. 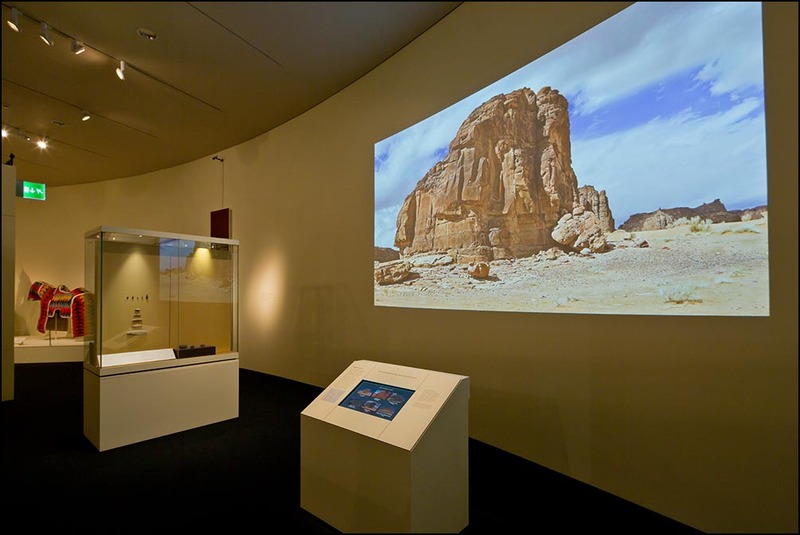 Based on questionnaire findings about the gigapixel image interaction: for 38% of visitors it Strongly Enhanced their visit, for 32% it Slightly Enhanced, for 30% Neither, and it slightly and strongly distracted for 0%. So effectively 70% of visitors said it had enhanced their enjoyment in some way. 95% of all visitors observed were seen to engage with the Gigapan in some way. 34% of these visitors successfully engaged with the interactive, reaching Discovery or Immersion levels of engagement. MHM map depth of engagement using an applied scale of engagement stages. Orientation is the stage at which the visitor evaluates the opportunity and decides whether to invest further time and effort. If they do, they progress to the Exploration stage in which they examine, read or touch in an attempt to make meaning and achieve a worthwhile outcome. If they achieve such an outcome they progress to the Discovery stage in which they get the return on their investment. If they become engrosssed or fascinated or simply make a strong connection, then they may reach the ultimate stage of Immersion. 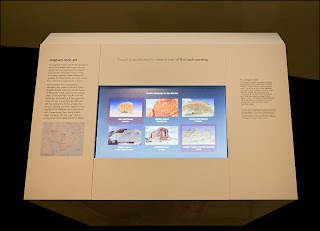 Alongside this they note whether visitors use interpretation, eg audio, visual or textual interpretation. Their analysis provides a series of consistent quantitative measures of the qualitative experience.